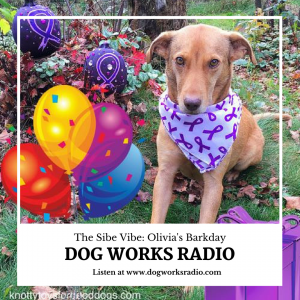 On this very special episode of “The Sibe Vibe,” host Dorothy Wills-Raftery is talking about an 8thBarkday Card Drive fundraiser for Epi-dog “Olivia” Barnaby that will benefit The Wally Foundation~Canine Epilepsy (TWF) ~and~ give details about the (p)awesome items donated for a Barkday Goodie Basket that will be randomly selected by Olivia’s hu-mom for one lucky donator on July 1, 2018! A “surprise” gift from Rick Selwood, Founder & Executive Director of The Wally Foundation. To be entered into the Giveaway, be sure to comment Happy Barkday, Olivia! Who is Olivia? Olivia is the sweet adopted dog of Jeanaann Barnaby and the star of her own Facebook page – Oh, the Life of Olivia! – and the CEO (Canine Executive Officer) of Jeanaann’s home business, Knotty Toys for Good Dogs. In addition to her online store of homemade hemp chew toys, Jeanaann also shares information on Canine Epilepsy Awareness in her blog on the website. Jeanaann also donates a portion of her Knotty Toys sales to The Wally Foundation~Canine Epilepsy, where she is also their online communications director. Olivia has almost daily focal seizures and periodic gran mal seizures. She was diagnosed in 2011 with idiopathic Canine Epilepsy, and along with her hu-mom, have become advocates for dogs living with Canine Epilepsy. 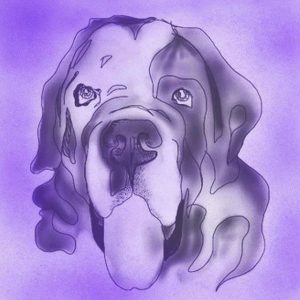 The Wally Foundation is a non-profit organization that offers possible financial assistance for much needed anti-seizure medications to families, rescues, and fosters of dogs diagnosed with idiopathic Canine Epilepsy. In 2018, Dorothy’s book EPIc Dog Tales: Heartfelt Stories About Amazing Dogs Living & Loving Life With Canine Epilepsywas awarded the Independent Press Award for “Excellence” the Reference book and in 2017 it was received the New York City Big Book Award for “Excellence” in the Animal/Pet book category. Named “Best Author” in 2015 & 2016 by Hudson Valley Magazine, and all four of her books named “Best in Print” by American Pet Magazine, Dorothy is a 9-time Dog Writers of America Association (DWAA) “Excellence” nominee, including a nod for “Excellence” for the “Talking Canine Epilepsy” episode of The Sibe Vibe featuring Dr. Karen Muñana and Julie Nettifee of North Carolina State University College of Veterinary Medicine. In 2017 Dorothy was awarded the DWAA’s prestigious Maxwell Medallion for “Excellence” for her Red Nose Day photo poster and in 2016 for her article on rescue dogs, both published in her FiveSibes blog. Dorothy is the creator of the FiveSibes #LiveGibStrong K-9 Epilepsy Awareness and Education campaigninspired by her own Epi-dog, Siberian Husky, Gibson. An official International Purple Day® for Epilepsy Ambassador since 2012, Dorothy partnered with The Anita Kaufmann Foundation in 2018 for the launch of her #LiveGibStrong #Paws4Purple K-9 Epilepsy project, and she is a volunteer case manager for The Wally Foundation-Canine Epilepsy. In addition to her Siberian Huskies, Dorothy shares her home with her husband, daughter, son-in-law, and new grandson. You can follow Dorothy and her FiveSibes on their website at http://www.FiveSibes.com, on Facebook at FiveSibes: Siberian Husky K9 News & Reviews, as FiveSibes Mom on Google + and on Twitter as @FiveSibesMom.